Unfold the pastry sheet on a lightly floured surface. Roll the pastry sheet into an 18x9-inch rectangle. Cut into 18 (3-inch) squares. Press the pastry squares into 18 muffin-pan cups. Brush the edges of the pastries with the egg. Prick the centers of the pastries with a fork. Bake for 10 minutes or until the pastries are golden brown. Using the back of a spoon, press down the centers of the hot pastries to make an indentation. Let the pastries cool in the pans on wire racks for 5 minutes. Remove the tartlet shells from the pans and let cool completely on wire racks. Beat the cream cheese in a medium bowl with an electric mixer on medium speed until smooth. Beat in the confectioners' sugar and vanilla extract. Fold in the whipped topping. Spoon about 1 tablespoon cream cheese mixture into each tartlet shells. Refrigerate for 10 minutes or until the filling is firm. 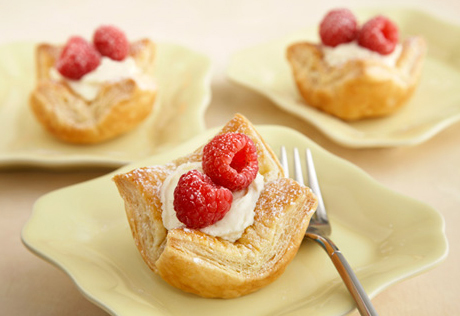 Top each pastry with 2 raspberries. Sprinkle with additional confectioners' sugar, if desired.